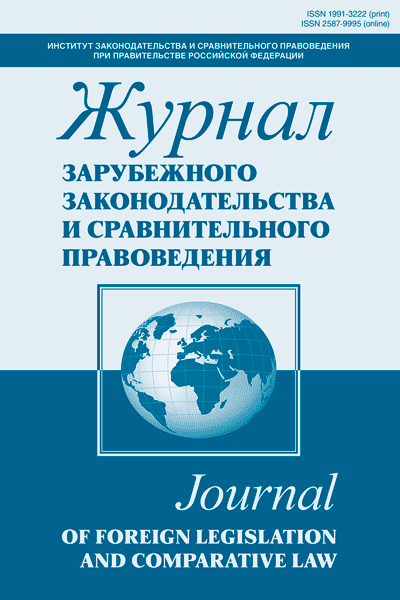 The procedure for reviewing of scientific articles which reflect the main results of the research conducted by the author (authors), scientific reviews, reviews (further - articles) submitted for publication in the Journal of Foreign Legislation and Comparative Law (hereinafter - Journal) is carried out by researches and specialists of the Institute of Legislation and Comparative Law under the Government of the Russian Federation before publication. The purpose of the review is to increase the scientific level of the materials which are published in the Journal and to ensure the quality of the article that corresponds to international rules adopted in authoritative reference databases of scientific citation. The review process is organized by the Deputy Editor-in-Chief of the Journal. The choice of review experts refers to the powers of the Editorial Council. The reviewer is appointed on the basis of his specialization and qualification, taking into account the subject matter of the submitted scientific article. Reviewers are notified that the materials are the results of intellectual activity, capable of legal protection, and refer to information not to be disclosed. The reviewers are not informed about the authors’ name. Reviewing is carried out within a period of not more than 30 days. • conclusion about the possibility of publishing this article in the Journal: "recommended", "recommended with correction of the deficiencies noted by the reviewer" or "not recommended". The reviewer's comments on the submitted article are transmitted to the author for correction. The author is not informed about the name of the reviewer. If there are any comments, the date of receipt of the material in the Editorial Office shall be the date of return of the finalized article by the author. The finalized article is re-directed to the same reviewer for the additional review. The originals of the reviews or their electronic copies are stored in the Editorial Office for five years from the date of signature by the reviewer.